I realise talking about the heat wave is so ‘four days ago’ but when the heat was on, all anybody could talk about was the weather, how hot it was, how hot it was going to get and, most importantly, what the overnight low was going to be. When the heat is unrelenting even during the night, it makes it difficult to recover to face the extreme heat the next day. You feel like you are walking around with a permanent grimace, because the furnace-like heat is always so in your face. I was in Melbourne for the start of the heat wave and then flew out just before the cool change and into Wagga for another couple of days of over-40°C temperatures. When I flew out of Wagga a few days later, the heatwave had broken but it was still 33°C – still pretty hot – but then I flew into the warm, sticky, humid embrace of Sydney which was a relief after the searing dry heat of the west. During all this heat, the Australian Open soldiered on with some tennis players collapsing on court and hallucinating, and everyone divided into two camps: those determined to have the play go on, no matter how hot it got, and those who couldn’t believe they were expected to play in these inhumane conditions. In this kind of collective heat derangement, strange rumors erupted, such as one Tweet I read just before I was about to fly out of Melbourne – that all flights had been cancelled out of Tullamarine because the tarmac had melted. When I finally got to the airport, my plane was delayed for what was a fairly polite 10 minutes because the plane we were meant to catch was ‘unserviceable’. What they meant by ‘unserviceable’, nobody really dared to ask. It was nearly 7pm when we finally walked out onto the tarmac to catch our plane and the heat was still like walking into the vent of a clothes dryer. I have friends who, despite their lack of air conditioning, remain very stoic about the extreme heat, believing it something that that should be suffered through so you can really appreciate the cool change when it does come through. For those in the northern hemisphere who don’t know what we’re wailing about, here are a few quick conversions for our recent heatwave which was five consecutive days of over 40°C, or 104°F. Poor Adelaide had one day of being the hottest inhabited city on the planet when the temperature hit a peak of 46°C, or 114.8°F. Hot! In the midst of this heat vortex, if you don’t have the luxury of air conditioning, cooking anything is out of the question. In fact, you need meals you can kind of of just assemble, and watermelon – cold watermelon straight from the fridge is the food of the gods. 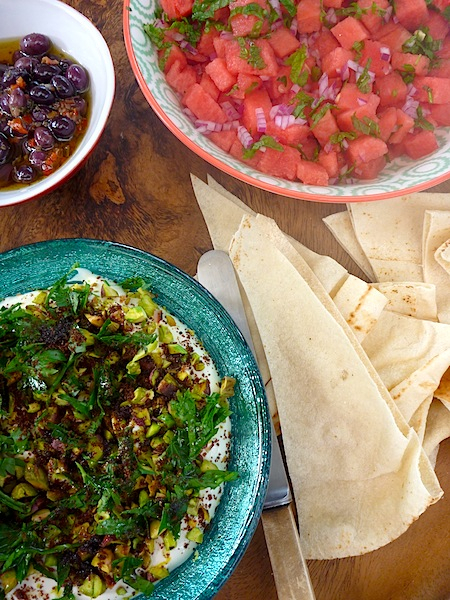 Delicious as watermelon is, you need something else on the side to sustain you and this labneh dip, with its crunchy topping of toasted pistachios, parsley, lemon and sumac, makes your watermelon meal a bit more substantial. Throw in some olives and flat bread (with special prayer of thanks to the bakers who continue to bake during the heat) and you can call it dinner, lunch or breakfast. Labneh is yoghurt that’s been drained of its whey until it has the consistency of whipped cream cheese. I always tend to buy my labneh ready made because its so easily available where I live but if you want to make your own, Simple Provisions has very clear instructions here. When I first made this dip, I served it with these vegetarian vineleaves and it was an incredible combination but, of course, when you’re in the middle of a heatwave, you’re not going to be messing about making vineleaves (except perhaps to open a tin of them). Feta cheese is also good with watermelon, so if you can’t be bothered making the dip, watermelon salad served with chunks of feta cheese is also a pretty awesome combination. Stir crushed garlic and honey through labneh and season to taste with salt and pepper. 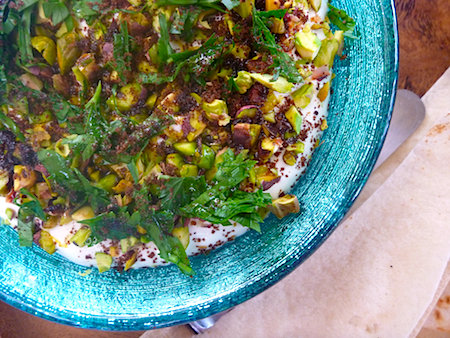 Pour labneh into a bowl and spinkle over lemon zest, pistachios, parsley and sumac. Then drizzle olive oil over the top. Serve with flat bread and olives or part of mezze spread. 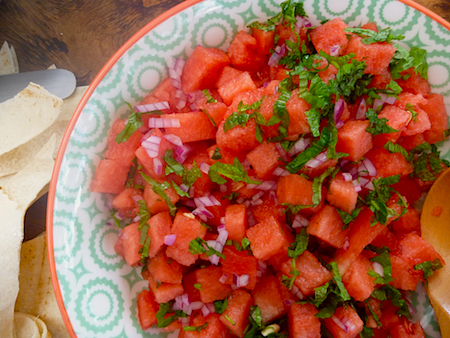 Chop watermelon into small chunks and mix with red onion and mint. If you are using feta, mix cubes or crumble cheese through watermelon salad. Sprinkle lime juice and olive oil over the top and mix to dress. Love that labna…not so readily available here, but it’s easy to make. Looks great with the watermelon salad!!! You make those delicious labneh balls in oil. The heat seems to have hit over your way again Christine, hope you’re surviving okay. Only just…with the help of a paddle pool! One of my brothers lives in Tassie so I know the heat does get unbearable in the high thirties. In the good old days a heatwave was just 4 or more days of over 35 temperatures now that’s looking mild. Living in the Southern Highlands of NSW we managed the same heat wave [well only up to 41 C or so] and for almost two days more than Victoria ere the weather cooled. I do not have AC and the nights were definitely no fun as the temps refused to drop! Oh, we put up with the heat glady as long as the October bushfires did not return [had four big ones surrounding us for 3 weeks and were on evacuation alert half that time!!] . . . the present coolish/cloudy days very welcome!! This is a lovely labneh recipe I must try . . . I like to make my own yogurt and then labneh: cheat with Easy-Yo 🙂 ! A full meal for me with a few crusts of pita and the watermelon!!!! Yes I was in Wagga NSW which had a couple more days of heat wave so I sympathise with you. The labneh is easy to make and you can drain it in the fridge. I’m appreciating the break in the heat though I even baked some cheesey scrolls for my son and his friends for morning tea today. That sounds so amazing! We have an A/C but it’s an old one and I was terrified it was going to break down. I’m so glad the weather has broken and it’s a little cooler here now, unfortunately it’s normal where I live to have several weeks in the high 40’s each year yet somehow I never get used to it. Thanks for linking up this delicious meal! If I had to live in a place that hot I’d need super duper air conditioning. My brother has evaporative air con and I love it. Oh this is gorgeous! I must remember it for the next Adelaide scorcher! Poor Adelaide it’s really copping it this summer. I thought I survived the heat quite well but ended up sick as a dog as a result of all those air conditioned escapes from the heat I suspect. 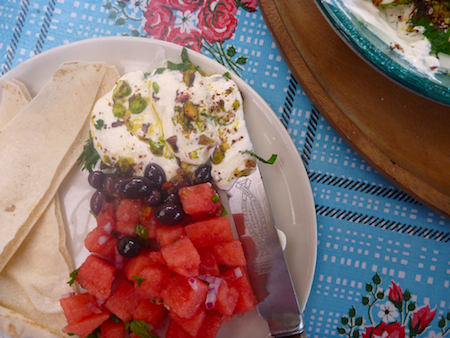 this post reminded me of childhood friends of my parents who’d always eat watermelon and feta, all summer; your labneh is intriguing and refined, would love to sneak in a bite! There’s something about the salty taste of feta and the freshness of watermelon that make it one of the most refreshing salads to make in the heat. That labneh dip looks delicious! Considering we’re about to enter another heatwave (30+ for the next week & 41 on Sunday, yuck!) this might be just what I need to get me through! Melbourne really swelters in the heat too, there is nowhere cool to hide. This one too! How am I going to decide which one to make?! I made this combo for a friend who came over for a play date with her Bub during the first heatwave of our Sydney summer and we just kept saying “ooohhh isn’t it refreshing?” as we are it. So perfect for the hot weather. Thank you for sharing!